Scene of the Genpei war (17th century screen). The Gempei war or Genpei war (源平合戦, Genpei kassen, Genpei gassen, 1180–1185) was a series of conflicts between the Taira and Minamoto clans during Japan's late-Heian period that led to the fall of the Taira clan and the establishment of the Kamakura shogunate under Minamoto Yoritomo in 1192. The Gempei War thus lies at the foundations of the 650-year era of the shogunate system, which was essentially a military rule with the emperor serving as a figurehead. Establishing the shogunate system was a major step in the Japanese people's consolidation as one nation. The name "Genpei" (pronounced and sometimes written as Gempei) comes from alternate readings of the kanji for 'Minamoto' (源) and 'Taira' (平). The conflict is also known in Japanese as the Jishō-Juei War (治承・寿永の乱, Jishō-Juei no ran), after the two eras between which it took place. This great Japanese civil war erupted from a dispute about succession to the throne in which the Minamoto (also called Genji) and the Taira clans each supported a different candidate. The ensuing Battle of Uji (1180), fought just outside Kyoto, marked the start of a five-year war that concluded with a decisive Minamoto victory in the naval Battle of Dan-no-ura (壇の浦の戦い). The Gempei War was characterized by rich dramatic elements such as the tragic personal lives of its key figures, the rapid downfall of the powerful Taira clan, and the cleverness and wisdom of the military strategists. All of these elements were subsequently depicted in great detail in folklore, plays, and literature, including The Tale of the Heike. The stories were also used to introduce Buddhist themes such as the fragility and transience of life and of material wealth and glory. The Tale of the Heike was often recited by blind Buddhist monks to the accompaniment of a melancholic Japanese lute. Significantly the warring sides were known by their colors: red for the Taira clan and white for the Minamoto, which combined are the colors of the Japanese flag today. The Genpei Wars were the culmination of a decades-long conflict between the Minamoto and Taira (Heike) clans over dominance of the Imperial court, and therefore, control of Japan. In the Hōgen Rebellion and Heiji Rebellion of earlier decades, the Minamoto attempted to regain control from the Taira and failed. The Taira then began a series of executions, intended to eliminate their rivals. In 1177, relations between the Taira clan and the retired Emperor Go-Shirakawa (後白河天皇) became strained, and the Emperor attempted a coup d'état to oust the Daijō Daijin (prime minister), Taira no Kiyomori (平 清盛). Kiyomori defeated the former emperor and abolished the Insei (cloistered rule) system (院政), provoking strong sentiments against the Taira. On March 21, 1180, after the abdication of Emperor Takakura (高倉天皇 ), Taira no Kiyomori put his grandson, then only two years of age, on the throne as Emperor Antoku (安徳天皇). The actions of Taira no Kiyomori deepened Minamoto hatred for the Taira clan. Go-Shirakawa's son, Prince Mochihito (以仁王), felt that he was being denied his rightful place on the throne and, with the help of Minamoto no Yorimasa (源頼政), sent out a call to arms to the various samurai families and Buddhist monasteries on May 5, 1180. In June, Kiyomori moved the seat of imperial power to Fukuhara (modern day Kobe), in the hope of promoting trade with Song Dynasty (Chinese: 宋朝) China. 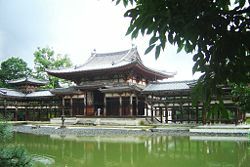 Kiyomori called for the arrest of Mochihito, who on the fifteenth day of June, fled Kyoto and sought protection at the famous Buddhist temple complex of Mii-dera (三井寺). The Phoenix Hall of the Byōdō-in, where Yorimasa committed seppuku. The Mii-dera monks were unable to ensure Prince Mochihito sufficient protection, so he was forced to move on. He was pursued by Taira forces to the Byōdō-in (平等院), just outside Kyoto. The war began there with a dramatic encounter on and around the bridge over the River Uji. This battle ended in Yorimasa's ritual suicide inside the Byōdō-in and Mochihito's capture and execution shortly afterwards. This incident roused Minamoto no Yoritomo (源 頼朝) who had been in exile, to take over leadership of the Minamoto clan and travel the country seeking allies. Leaving Izu Province, he was defeated by the Taira in the battle of Ishibashiyama (石橋山の戦い) on his way to the Hakone Pass. However he fled successfully to the provinces of Kai and Kozuke, where the Takeda clan and other friendly families helped repel the Taira army. Meanwhile, Taira no Kiyomori, seeking vengeance against the Mii-dera monks and others, besieged Nara and burnt much of the beautiful city to the ground. Fighting continued the following year. Minamoto no Yukiie (源行家) launched an unsuccessful sneak attack against the army of Taira no Tomomori (平知盛) at the battle of Sunomata (墨俣川の戦い). He pursued them to the Yahahigawa (矢作川), and destroyed the bridge over the river in order to slow the Taira progress. He was defeated and forced to withdraw once again, but Taira no Tomomori fell ill and called off his pursuit of Yukiie's forces. Taira no Kiyomori died from illness in the spring of 1181, and around the same time Japan began to suffer from a famine that would last through the following year. The Taira moved to attack Minamoto no Yoshinaka (源義仲), a cousin of Yoritomo, who had raised forces in the north, but were unsuccessful. For nearly two years, the war ceased, only to resume in the spring of 1183. Minamoto no Yoritomo grew uneasy about the strength of his cousin Yoshinaka’s forces. Yoshinaka had sought to occupy lands controlled by Yoritomo, which had earlier belonged to Yoshinaka's father. Yoritomo launched a series of attacks against Yoshinaka. Though the two reconciled and agreed to unite against their common enemy, the Taira, their rivalry remained strong throughout the war. Forced to recognize Yoritomo as the head of the Minamoto clan and to send his young son Minamoto no Yoshitaka to Kamakura as a hostage, a common practice meant to assure a temporary peace. Yoshinaka determined to defeat the Taira himself and to reach Kyoto before Yoritomo and claim victory and honor for himself. Allaying Yoritomo's suspicions of treachery, Yoshinaka survived an assault on his fortress at Hiuchiyama (火打ち山) by Taira no Koremori (平維盛) and engaged Koremori again at the battle of Kurikara, also known as the battle of Tonamiyama (砺波山). Yoshinaka's victory at Kurikara for the Minamoto proved to be the turning point in the war. Using creative tactics, a skillful division of his forces and a series of bluffs and diversions, Yoshinaka inflicted heavy losses on the Taira, who fled, confused and demoralized. The Taira loss at Kurikara was so severe that they found themselves, several months later, under siege in Kyoto, with Yoshinaka approaching the city from the northeast and Yukiie from the east. Both Minamoto leaders had encountered little or no opposition in marching to the capital and now forced the Taira to flee the city. Taira no Munemori (平宗盛), head of the clan since his father Kiyomori's death, led his army, along with the young Emperor Antoku (安徳天皇) and the Imperial regalia of Japan (三種の神器), to his clan's fortresses in western Honshū and Shikoku. The Taira clan set fire to their Rokuhara palace and the surrounding district, leaving Minamoto no Yoshinaka with the only force of any significant power in the Home Provinces (Kansai region, 関西地方) surrounding the capital. Empowered by a mandate from Emperor Go-Shirakawa (後白河天皇) to pursue the Taira and destroy them, Yoshinaka once again sought to gain control of the Minamoto clan and regain his ancestral lands from his cousins Yoritomo and Yoshitsune (源 義経). The fleeing Taira set up a temporary Court at Dazaifu in Kyūshū, the southernmost of Japan's main islands. They were forced out soon afterwards by local revolts, spurred by Emperor Go-Shirakawa, and sought refuge at Yashima, a small island in the Inland Sea. Yoshinaka sent a force to pursue the Taira in the south, while he led a second force back to Kamakura to delay his cousins' actions. While his men lost to the Taira at Mizushima (水島), Yoshinaka conspired with Yukiie to seize the capital and the Emperor, and possibly establish a new Court in the north. However, Yukiie revealed these plans to the Emperor, who communicated them to Yoritomo. Betrayed by Yukiie, Yoshinaka took command of Kyoto and, at the beginning of 1184, pillaged the city and set fire to the Hōjūjidono Buddhist temple (法住寺殿), taking the child Emperor into custody. Minamoto no Yoshitsune arrived soon afterwards with his brother Minamoto no Noriyori (源範頼) and a considerable force, driving Yoshinaka from the city. After fighting his cousins at the same bridge over the River Uji where the war had begun, Yoshinaka made his final stand at Awazu, in Ōmi province. 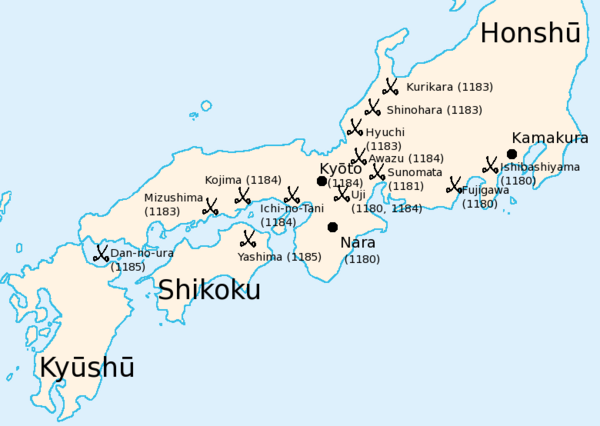 As the united Minamoto forces left Kyoto, the Taira began consolidating their position at a number of sites in and around the Inland Sea, which was their ancestral home territory. They received a number of missives from the Emperor promising that if they surrendered by the seventh day of the second month. the Minamoto could be convinced to agree to a truce. This was a farce, as neither the Minamoto nor the Emperor had any intentions of waiting until the eight day to attack. Nevertheless, this tactic offered the Emperor a chance to regain the Imperial Regalia and to distract the Taira leadership. The Minamoto army, led by Yoshitsune and Noriyori, made their first major assault at Ichi-no-Tani (一の谷), one of the primary Taira fortresses on Honshū. The fortress was surrounded, and the Taira retreated to Shikoku. However, the Minamoto were not prepared to assault Shikoku; a six-month pause thus ensued during which the Minamoto made preparations for an assault. Though in retreat, the Taira enjoyed the advantages of being in friendly home territories, and of being far more adept at naval combat than their rivals. It was not until nearly a year after Ichi-no-Tani that the main Taira fortress at Yashima came under assault. Seeing bonfires on the mainland of Shikoku, the Taira expected a land-based attack and took to their ships. This was a deception on the part of the Minamoto, however, who lay in wait with their own navy. The Yashima fortress fell, along with the improvised imperial palace built there by the Taira, but many of the Taira escaped along with the Imperial regalia and the Emperor Antoku. The Genpei War ended one month later, following the battle of Dan-no-ura (壇の浦の戦い), one of the most famous and important battles in Japanese history. The Minamoto engaged the Taira fleet in the Straits of Shimonoseki (the Kanmon Straits, 関門海峡), a tiny body of water separating the islands of Honshū and Kyūshū. After a series of archery duels, hand-to-hand fighting broke out. The tides played a powerful role in the development of the battle, granting the advantage first to the Taira, who were more experienced sailors, and later to the Minamoto. The Minamoto advantage was augmented by the defection of Taguchi Shigeyoshi, a Taira general who revealed the location of Emperor Antoku and the Imperial regalia. The Minamoto soldiers redirected their attention to the Emperor's ship, and the battle quickly swung in their favor. Many of the Taira samurai, along with eight-year-old Emperor Antoku and his grandmother Taira no Tokiko, widow of Taira no Kiyomori, threw themselves into the waves to drown rather than live to see their clan's ultimate defeat at the hands of the Minamoto. The Taira clan was almost destroyed, and the Minamoto victory was followed by the establishment of the Kamakura shogunate. Though Minamoto no Yoritomo was not the first to hold the title of shogun, he was the first to wield it over the whole nation of Japan. The end of the Genpei War and beginning of the Kamakura shogunate marked the rise of military (samurai) power and the suppression of the power of the emperor, who was compelled to preside without effective political or military authority until the Meiji Restoration more than 650 years later. This war and its aftermath established red and white, the respective colors of the Taira and Minamoto, as Japan's national colors. Today, these colors can be seen on the national flag of Japan, and also in banners and flags in sumo (相撲) and other traditional activities. 1180 First Battle of River Uji - regarded as the first battle in the Genpei Wars; the monks of the Byodoin (Buddhist temple) fought alongside Minamoto no Yorimasa. 1180 Battle of Ishibashiyama - Minamoto no Yoritomo 's first battle against the Taira. Minamoto Yoritomo lost the battle. 1180 Battle of Fujigawa - the Taira mistook a flock of waterfowl for a sneak attack by the Minamoto in the night, and retreated before any fighting occurs. 1181 Battle of Sunomata - the Taira thwarted a sneak attack in the night but retreated. 1181 Battle of Yahagigawa - the Minamoto, retreating from Sunomata, Gifu, attempted to make a stand. 1183 Siege of Hiuchi - the Taira attacked a Minamoto fortress. 1183 Battle of Kurikara - the tide of the war turned, in the Minamoto's favor. 1183 Battle of Mizushima - the Taira intercepted a Minamoto force, heading for Takamatsu, Kagawa, Yashima. 1183 Siege of Fukuryuji - the Minamoto attacked a Taira fortress. 1183 Battle of Muroyama - Minamoto no Yukiie tried and failed to recoup the loss of the battle of Mizushima. 1184 Siege of Hojujidono - Yoshinaka set fire to the Hojuji-dono (Buddhist Temple) and kidnapped Emperor Go-Shirakawa who was temporarily cloistered there. 1184 Second Battle of Uji - Yoshinaka was pursued out of the capital by Yoshitsune and Noriyori. 1184 Battle of Awazu - Minamoto no Yoshinaka was defeated and killed by Yoshitsune and Minamoto no Noriyori. 1184 Battle of Ichi-no-Tani - the Minamoto attacked one of the Taira 's primary fortresses. 1184 Battle of Kojima - Taira fleeing Ichi-no-Tani were attacked by Minamoto no Noriyori. 1185 Battle of Yashima - the Minamoto assaulted their enemies' fortress, just off the smaller island of Shikoku. The Minamoto were one of the four great clans that dominated Japanese politics during the Heian period (794-1185). They were, however, decimated by the Taira in the Heiji Rebellion of 1160. Minamoto no Yoshitomo had been the head of the clan at this time; upon his defeat at the hands of Taira no Kiyomori; two of his sons were killed and three others, Minamoto no Yoritomo, Minamoto no Yorinori, and Minamoto no Yoshitsune were banished. Following the call to arms of Prince Mochihito and Minamoto no Yorimasa in 1180, the clan gathered together and rose to power again. During the Genpei war, the Minamoto clan defeated the Taira and took command of the entire country. Minamoto no Noriyori (源範頼), general, younger brother of Yoritomo. Minamoto no Yorimasa (源頼政), head of the clan at the beginning of the war. Minamoto no Yoritomo (源頼朝), head of the clan upon Yorimasa's death. Minamoto no Yoshitsune (源義経), younger brother of Yoritomo, chief general of the clan. Minamoto no Yukiie (源行家), general, uncle to Yoritomo. Emperor Go-Shirakawa (後白河), cloistered (retired) emperor. Prince Mochihito (以仁王), Imperial Prince. 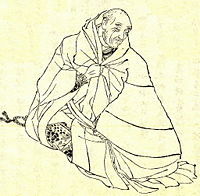 Saito Musashibo Benkei (弁慶), sōhei (warrior monk), ally of Yoshitsune. Hōjō Tokimasa (時政 北条), head of the Hōjō clan (北条), father-in-law of Yoritomo. Kajiwara Kagetoki (景時 梶原), officially an ally of Yoshitsune; in fact a spy for Yoritomo. 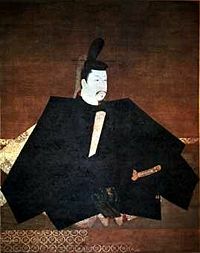 Kumagai Naozane (直実 熊谷), samurai vassal of Yoritomo. Sasaki Moritsuna (盛綱 佐々木), vassal of Noriyori who commanded the assault at the battle of Kojima. Taguchi Shigeyoshi (重能 田口), Taira general who turned to the Minamoto camp upon seeing the tide turn at the battle of Dan no Ura, thus ensuring Minamoto victory. Nasu no Yoichi (那須与一), celebrated archer and Minamoto ally. Yada Yoshiyasu (矢田 義康), vassal of Yoshinaka and commander of Minamoto forces at the battle of Mizushima. Ichirai Hoshi (一来 法師), who is famous for having jumped ahead of Jomyo Meishu and led the Mii-dera monks to battle. Gochin no Tajima (ごちん忽), called Tajima the arrow-cutter, and famous for deflecting the arrows of the Taira with his pole weapon called a naginata, upon the bridge over the River Uji. Tsutsui Jomyo Meishu (筒井 浄妙 めいしゅ), who fought to his last on the brigde over the Uji, taking over 60 arrows and still fighting. Imai Kanehira (兼平 今井), who joined Yoshinaka in his escape to Seta. Tomoe Gozen (巴御前), wife or concubine of Yoshinaka, and commander of one of his armies. The Taira clan was one of the four great clans that dominated Japanese politics during the Heian period (794-1185). As a result of the near-total destruction of their rival clan, the Minamoto, in the Heiji Rebellion of 1160, Taira no Kiyomori, head of the clan, initiated the Genpei War at the height of his power. The end of the war, however, brought destruction to the Taira clan. Taira no Atsumori (平敦盛), 15-year old samurai killed by Kumagai Naozane who, because of his youth and innocence, became quite famous in death. Taira no Kiyomori (平清盛), head of the clan at the beginning of the war. Taira no Koremori (平維盛), grandson of Kiyomori. Taira no Munemori (平宗盛), son and heir of Kiyomori; head of the clan for much of the war. Taira no Shigehira (平重衡), general, son of Kiyomori. Taira no Tadanori (平忠度), general, brother of Kiyomori. Taira no Tokiko (平時子), wife of Kiyomori who committed suicide at the great sea battle of Dan-no-ura rather than be captured. Taira no Tomomori (平知盛), general, son of Kiyomori. Taira no Yukimori (平行盛), general, commander of the Taira forces at the battle of Kojima. Crown Prince Antoku (安徳), Crown Prince of Japan and grandson of Taira no Kiyomori, who was drowned at age eight by his grandmother rather than face defeat. Ōba Kagechika (景親 大庭), vassal of the Taira. Saitō Sanemori (実盛 斎藤), former vassal of Minamoto no Yoshitomo, switched sides and became a vassal of Taira no Munenori. Seno Kaneyasu (兼康 妹尾), vassal of the Taira who commanded at the Fukuryūji fortress. Taguchi Shigeyoshi (重能 田口), Taira general who switched sides and joined to the Minamoto camp upon seeing the tide turn at the sea battle of Dan no Ura, thus ensuring Minamoto victory. The sōhei (warrior-monks) of Enryaku-ji (延暦寺), Buddhist temple at least in theory, on account of their rivalry with the Mii-dera, which was allied with the Minamoto. Many stories and works of art depict this conflict. The Tale of the Heike (Heike Monogatari, 平家物語) is one of the most famous, though many Kabuki and bunraku plays reproduce events of the war as well. Ichinotani futaba gunki (Chronicle of the battle of Ichi-no-Tani) by Namiki Sōsuke may be one of the more famous of these. "Shike" by Robert Shea features a fictionalized account of the wars, as seen from the perspective of his two main characters, the Zinja Monk Jebu, and the Noblewoman Taniko. De Benneville, James S. 1910. Saitō Musashi-bō Benkei tales of the wars of the Gempei, being the story of the lives and adventures of Iyo-no-Kami Minamoto Kurō Yoshitsune and Saitō Musashi-bō Benkei the warrior monk. Philadelphia: P. Reilly. Yoshikawa, Eiji. 1956. The Heiké story. New York: A. A. Knopf. This page was last modified on 7 December 2013, at 16:05.